Lamar Giles is an Edgar Award-nominated author and has published three young adult novels. He is the co-founder of #WeNeedDiverse books and has edited two #WNDB anthologies, including 2018's Fresh Ink. London born and bred but of Nigerian heritage, Dapo Adeola is an illustrator and designer who creates characters and images that challenge gender norms in a fun and upbeat way. 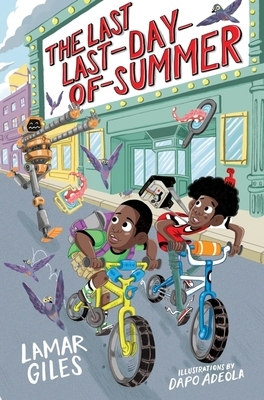 He is the co-creator and illustrator of the upcoming picture book series Look Up (June 2019) and illustrator for the middle grade novel The Last Last-Day-of-Summer by Lamar Giles (April 2019). When he’s not busy cooking up new characters and adventures, you can find him running illustration and character design workshops in and out of schools, to help highlight the possibilities of a career in illustration to inner-city children.